The Mardin Fatwa is a little known religious edict produced by Ibn Taymiyyah which is often seen as a religious justification for the immoral actions of the Salafi Jihadists. This short article will outline what is the Mardin Fatwa, its context and implications for modern times. 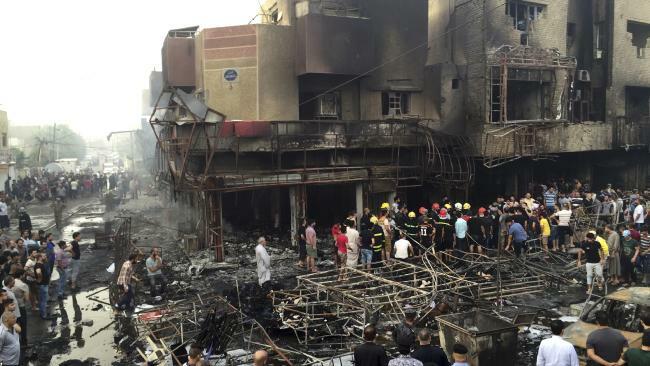 Another bombing in Iraq, this time in Karadar district of Baghdad, whilst families were shopping for Eid gifts and preparing food to break their fast, ISIS bombers were hard at work. Bangladesh was attacked recently as well, the same merciless attitude resulted in scores of innocent deaths. The question many ask in the face of such barbarity, is this “How could Muslims do these things? Many people look at the acts of terror committed and think “Why are Muslims doing theses things?”, this has partly been addressed in a previous article, this article however is more specific and will focus on the ideology of these Muslims and their rationale for committing their terror acts. The first thing to note is that the ideology is from a Sunni background, specifically Salafi, this is a version of Islam that is currently propagated from Saudi Arabia, however it is not the main, or original version of Islam. Remember, that document was written over ten years ago. It can be downloaded here. Again, it points to Salafi’s role in terror and attempts to dominate the region by force. The London School of Economics even has a course on “Political Islam: From Ibn Taymiyya to Osama bin Laden”, it seems there is little dispute about the religious source of the modern terrorist groups. So are these authors clairvoyant? or do they know something about Salafi views that predisposes their followers to certain activities? Lets examine how those in the know came to the understanding regarding Salafism. Ibn Taymiyya was born in 1263 in modern day Turkey, by the age of 7 his hometown was ravaged by the invading Mongols, and Ibn Taymiyyah and his family escaped to Damascus. After his studies, the Mongols had converted to Islam, but Ibn Taymiyyah was still not tolerant of them, despite them converted to Sunni Islam, he still issued a fatwa that Jihad against them is Obligatory, and even canceled Ramadan so that the fighters would not be weakened. A precedent had been set, the ends now justify the means, so to establish Sharia, there is now nothing that is taboo, killing other Muslims, halting religious obligations, to Ibn Taymiyyah and his followers whatever it takes is allowed. Abdul Salam Faraj (the mastermind behind the assassination of Egyptian President Anwar Sadat) argues that unbelievers are not only non-Muslims, but also those Muslims who do not adhere to Sharia. Evoking the ideas of classical Muslim scholar Ibn Taymiyya to state that an unbeliever is someone who does not believe or does not adhere to any of the prescripts of Islam, even if he pronounces the Islamic confessions of faith. He applied this to any and all of the laws of Islam and is a standard for the ruler and ruled alike. For many, Ibn Taymiyyah’s shadowy past represents a major problem, on the one hand people have been brought up to love and follow his texts, on the other, the texts appear to be incompatible with Islam and morality. To try to dodge this paradox some argue that Ibn Taymiyah did not actually say this, and it was a misprint, Sheikh Hamza Yusuf has this view. However, this view sounds like it fixes the problem that people who hold Ibn Tamiyah highly, however, this fatwa was not one off, and even more damning was Ibn Taymiyah actually fought the Muslim Mongols and other groups who did not explicitly agree with him, such as the Shia and some Ismaili groups. This is one of the most important lessons we can draw from Ibn Taymiyyah, he feels that merely saying what it is right or wrong is not nearly enough, he feels that Muslims must actively put into practice what he says. This is not to mention his views on the Christians or other groups, for example Ibn Taymiyyah led a campaign in 1293 to have a Christian executed for blasphemy, destruction of sacred artifacts in 1305 etc. This Salafi preacher (watch from 29 mins for 5 mins) gives his view on the greatness of Ibn Taymiyyah, and also explains the many “miracles” he performed and compares him to a Prophet. Essentially Muslims today are facing a problem, the books that are on their shelves, the speakers in their Mosques are all mentioning Ibn Taymiyah, but at the same time, his books are the inspiration for the worst of the worst terrorists. The Saudis resurrection of Ibn Taymiyah ideas and their spreading of his work has confused the Muslim masses and it is now up to the Muslims to counter the Saudi propaganda and change the narrative in the Muslim masses mind. To read more about the how Ibn Taymiyah and Salafism have created the terrorism we see today, click here to read a groundbreaking article exposing the direct link between salafism and terrorism. Who in Al Azhar is going to address this issue? Al Azhar has lost is influence and position in the Muslim world, and is rarely seen as a guiding force. I suspect this is due to years of political interference and confusion as to which way to lean eg traditional sunni or the salafi. I mean, do you read and follow what Al Azhar publishes? Yes, when I can find something from Al- Azhar in English. Who IS such a guiding force or is the religion of Islam more dependent upon exegesis from regional clerics? I would like to have a better sense of religious leadership within Islam, particularly within MENA. thank you. 12|104|You ask them no wage for it. It is only a reminder for all mankind.